​Submit Artwork for this year's Yearbook cover! One winner will be selected from each grade level and that artwork will be featured on the back cover of the yearbook. The winning artwork from the 6th Grade will be featured on the front cover. Print a contest form (to the left) for your student to submit with his/her contest entry. Please encourage your student to read and follow all directions. Remember, this is a STUDENT project, no help from parents. Entries are due by January 31st and this year's theme is "When You Wish Upon a Star." We have a fantastic new yearbook program this year. Each book will be fully customized for YOU! Each book will be printed-to-order, so there will be no extra books available at year-end. You MUST order online to have a book for your student. The directions below will explain how to place your order, and how you can personalize your student's yearbook. Buy the yearbook now, and then take your time making your personal pages. You can continue to add photos throughout the year. or want to help with yearbook??? Yearbook orders are processed through the publisher. All sales are final. 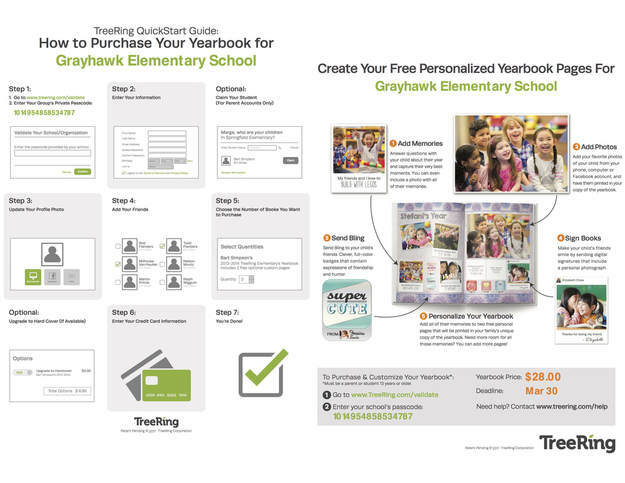 Grayhawk PTO is not able to offer any returns or refunds on yearbooks. Discount offers are through the publisher, so Grayhawk PTO is not able to extend any offers beyond expiration date.